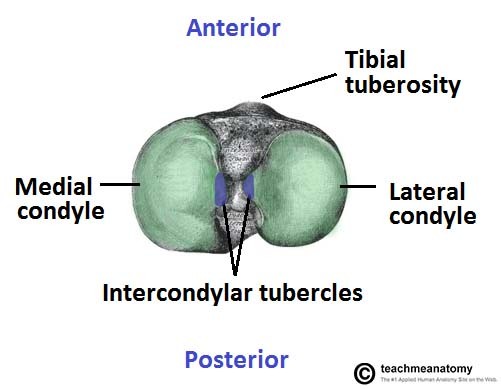 The tibial plateau most commonly fractures following high-energy trauma, such as a fall from height or a road traffic accident, from the impaction of the femoral condyle onto the tibial plateau. Less commonly they occur in elderly patients following a fall, especially those with osteoporosis. It is typically a varus-deforming force, meaning that the lateral tibial plateau is more frequently fractured than the medial side. They are often found alongside other bony and soft tissue injuries, such as meniscal tears or cruciate or collateral ligament injury. It is important to recognise that this is a significant injury, as there is disruption of the congruence of the articular surface that, if left, will lead to rapid degenerative change within the knee. Patients will present following a history of trauma. A clear history of the mechanism of injury is important, as an injury through axial loading or high-impact injuries will increase the likelihood. Patients will present with sudden onset pain in the affected knee, being unable to weight-bear, and associated with swelling of the knee*. On examination, significant swelling will be evident, alongside tenderness over the medial or lateral aspects of the proximal tibia, with potential ligament instability (albeit not clinically assessed initially, due to the pain it would cause). Ensure to check peripheral neurovascular status of the patient, as neurovascular injuries (such as popliteal vessel dissection or common fibular nerve damage) are an important association of high grade injuries. For patients presenting with knee pain following trauma, other differentials to consider are knee dislocation, other knee fractures (including patella or distal femur), meniscal injuries, ligamentous injuries, patella dislocation, or patella/quadriceps tendon rupture. 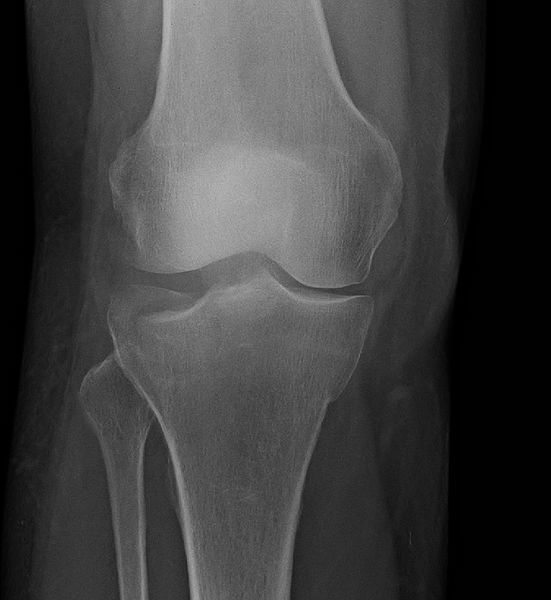 The first line investigation for a suspected plateau fracture is plain film radiographs (anteroposterior and lateral), often features on radiograph are subtle (Fig. 2). There will also be a lipohaemarthrosis present. CT scanning is needed in almost all cases (Fig. 3), apart from undisplaced fractures. This help both in assessment of severity, as well as surgical planning. These can typically be treated with a hinged knee brace and non- or partial-weight bearing for around 8-12 weeks, alongside ongoing physiotherapy and suitable analgesia. Operative management is typically warranted in complicated tibial plateau fractures*, or any evidence of open fracture or compartment syndrome. Any form of medial tibial plateau fractures may also require surgical intervention, even if undisplaced, as they have a great potential for displacement. Open reduction and internal fixation (ORIF) is the mainstay of most tibial plateau fractures, with the aim to restore the joint surface congruence and ensure joint stability. Any metaphyseal gaps can be filled with bone graft or bone substitute. Postoperatively, a hinged knee brace is fitted with early passive range of movement but limited or non-weight bearing for around 8-12 weeks months is typically required. External fixation may also be warranted, with delay to any ORIF, especially in cases of significant soft tissue injury or in polytrauma / highly comminuted fractures where an ORIF may not be suitable. 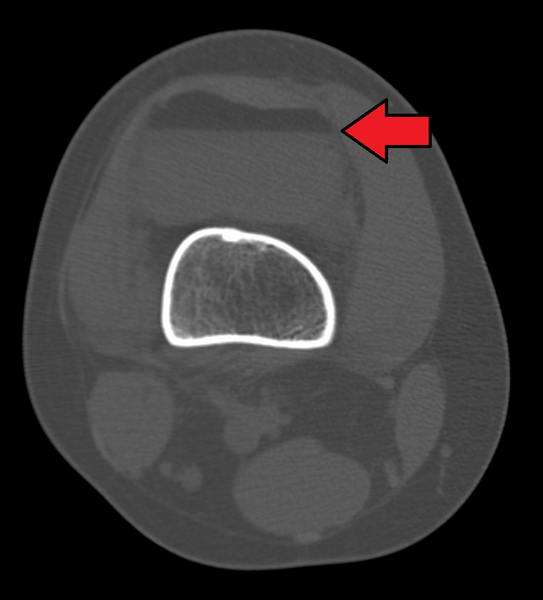 *Complicated fractures include those demonstrating an articular step ≥2mm, angular deformity ≥10 degrees, any metaphyseal-diaphyseal translation, ligamentous injury requiring repair, or those with associated tibial fractures. The main long-term complication following a tibial plateau fracture is post-traumatic arthritis to the affected limb.